Fiat Chrysler Eyes GM For An Unlikely Merger The auto industry does need to consolidate to keep up with investor expectations and growing expenses, but the merger might be too big a risk for GM, which already has a lot going for it. 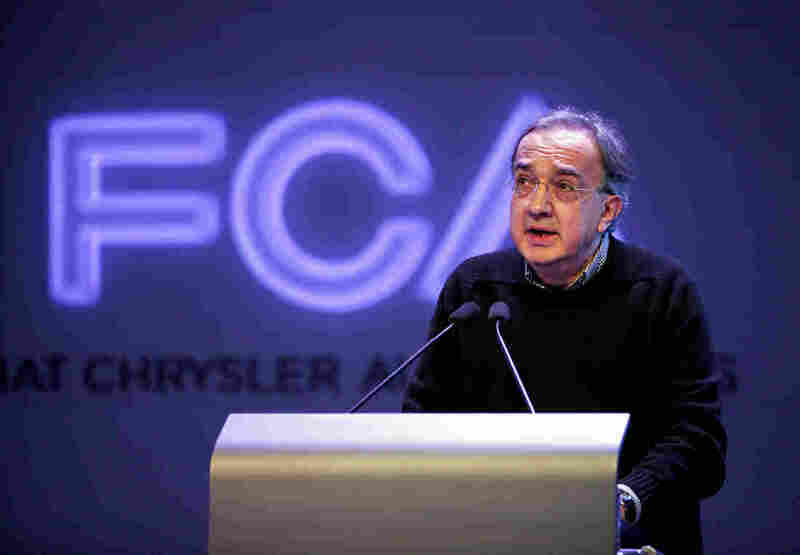 Fiat Chrysler Automobiles CEO Sergio Marchionne has asked his counterpart at General Motors to consider a merger. This spring, Fiat Chrysler CEO Sergio Marchionne fired off an email to the CEO of another major automaker, General Motors' Mary Barra, asking her to consider a merger between his company and hers. Publicly, GM politely declined the opportunity. Now, Marchionne is trying to get investors to force a shotgun wedding. Michael Ward, an investment analyst with Sterne Agee, says the answer is a no-brainer. "Chrysler merger with GM makes absolutely no sense," he says. "Zero sense." Ward thinks the idea of a merger is so crazy, it might tarnish Marchionne's image as a strategy genius. Ward ticks off a list of reasons the merger idea is bad, including everything that Fiat Chrysler has to offer, like a dealer network, a skilled workforce, factories and some valuable car brands. "GM doesn't need any of that," he says. "Be nice to have the Jeep brand. Be nice to have the Ram brand. But they don't need 'em. They don't need the distribution. They don't need the capacity. They don't need the brands. They have enough brands." And then there's what would happen to the little guy — blue collar and white collar alike. "For GM and Chrysler to combine, you'd probably lose at least half of Chrysler's workforce," Ward says. But Marchionne didn't give up after his proposal was rejected. Analysts say he was inspired by an activist investor who pressured GM to buy back $5 billion in stock from investors. According to Reuters, Marchionne hired investment bank UBS to make the pitch for a merger to investors. Then GM hired its own investment bank to make the opposite case. Marchionne is probably going to lose this one. "I think you have to put this in about as low a probability category as there is," says Steven Rattner, the former head of the U.S. auto task force. He oversaw both GM and Chrysler's bankruptcies. Rattner says there are too many egos involved, too much risk for GM and not enough investor will to force a shotgun wedding. But he says Marchionne is right in one big respect: The auto industry does need to consolidate. "Sergio has been talking about mergers since the first day I met him in 2009, and as is usually the case he's a clear thinker," Rattner says. Rattner says mergers, or some kind of cost-sharing joint ventures, make a lot of sense, because car companies face daunting challenges of growing expenses and investor dissatisfaction. Fiat Chrysler is especially unprepared for those challenges, according to economist Sean McAlinden of the Center for Automotive Research. The automaker has more than $8 billion in industrial debt. It's struggling in Europe and Brazil, and lagging badly in China. "They don't have any hybrids [or an] approach to lightweighting their vehicles, which is needed for higher fuel economy — at all. It's just not a good position to be in. Where he is is not the sweet spot," McAlinden says. He also doesn't expect Marchionne to succeed in his quest to merge his company with GM. McAlinden says that basically leaves Fiat Chrysler with two options: either find another company willing to merge, or start the long, slow and painful process of downsizing.